PGS typically costs the patient around $5,000 per IVF cycle and equates to 20 – 30% of the overall costs of treatment. Even for patients that have insurance that covers IVF, PGS is almost always excluded. Patients typically pay for two components of service. The patient will pay the clinic a fee to biopsy the embryos and will often pay a second fee to another party, a reference laboratory, to test that sample and provide a report. Typically, the payments are roughly $2,500 to each party. PGS is an exceptionally lucrative business, especially for the clinics. We estimate the clinic will make $1,500 - $2,000 in profit (what they bill you, minus their direct costs) for each biopsy whereas the reference laboratory makes closer to $1,000. We are not in a position to say if the PGS economics contribute to a clinic’s willingness to embrace it. We will say we see PGS used for more often in private, for-profit clinics than in academic medical centers. While patients have no choice but to pay their clinic for the biopsy if they do PGS, they do have a choice as to which reference laboratory they would like to work with. You may be able to drive a better deal, in exchange for equally good quality, by shopping around. Many clinics like to work with one or two preferred reference laboratories (often in exchange for a rebate that the clinic pockets), so don’t be surprised if you need to compare and shop for laboratories on your own. At a $5,000 cost, many patients wonder if PGS pays for itself. 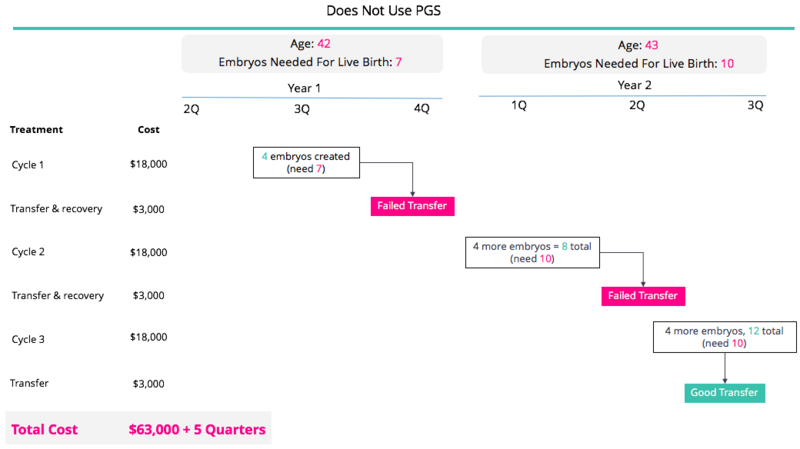 Proponents point to the fact that PGS reduces miscarriage rates and unsuccessful transfers and is worth the cost. Opponents believe that is not equally true for all patients and so we’ll provide a framework, using a theoretical example of two patient types, for how you may want think this through. We should note neither of these examples may reflect your circumstances and don’t account for the emotional value one may place on avoiding miscarriages and failed transfers. One concept for us to center on again is that the rate of euploid embryos differ by patient type. As we draw out these next two examples, we’ll use this chart as a basis for how helpful PGS might actually be. Let’s compare the number of transfers needed to succeed for a 32 year old woman with six embryos, three of which are euploid (50% euploid rate). As you can see in the chart below, we’ve assumed if the woman does PGS, her doctor picks a euploid embryo for each transfer and each leads to a 60% live birth rate. If the woman does not do PGS, her doctor must continually guess which is the best embryo to transfer and it will take her two-to-three transfers to reach a similar success rate as the woman who used PGS achieved on the first transfer. At a cost of $3,000 per transfer, the non-PGS patient is likely spending an additional $3,000 - $6,000 on extra transfers, which comes close to the cost of PGS at $5,000. On this basis, purchasing PGS probably pays for itself. When a transfer fails, it’s demoralizing, and many patients do not return to IVF after failure. We must take that into account, as it does impact a patient’s chances of exiting treatment with a baby. If a patient only has the emotional capacity to do one transfer, effectively PGS doubles (60% vs 30%) her likelihood of leaving treatment with a baby. Similarly, if that patient can only tolerate three transfers, PGS still makes a big difference (89% succeed vs 66%), assuming she had three euploid embryos to transfer. Given each IVF cycle costs $18,000 - $23,000, through this lens, PGS seems valuable. Many younger patients are hoping to have multiple children from embryos created in a single retrieval cycle. For many families that requires storing embryos at a cost of $500 - $1,000 per year. However, if a family’s excess embryos are non-viable, and they learn this up-front through PGS, they can avoid paying needless storage fees. Let’s assume a 42-year old woman creates four embryos. At this age, 20% of her embryos will be euploid (see the chart above) and so let’s assume none of her four embryos lead to a live birth. If her doctor uses PGS he will detect this and elect to not transfer any. If her doctor does not use PGS, let’s presume he does two futile transfers using two embryos at a time. The PGS patient will have ended up with the same result having (unfortunately, no child) saved $6,000 ($3,000 per transfer) by avoiding two needless transfers. Here, PGS paid for itself. Let’s assume the 42 year old woman does PGS, realizes her four embryos are not good, and manages to cycle immediately again, still at the age of 42. If she gets another four embryos, the odds are good one embryo will be euploid (remember, 20% of embryos are euploid for women age 42, and she’s had 8 embryos retrieved by this point) and lead to a live birth. In all she paid for two cycles ($18,000 x 2), 2 PGS tests ($5,000 x 2) and one transfer ($3,000) for $49,000 in total. Conversely, let’s assume the 42 year old woman does not do PGS, undergoes two failed transfers and after six months she is ready to cycle again, now at age 43. At this older age, fewer embryos are likely to be good (10% of embryos are euploid, per the chart above) and so the embryos from her second cycle aren’t sufficient. After another set of failed transfers (and six months lost), she is forced into a third cycle before she hopefully has enough embryos to have one that leads to a live birth. In this example, this woman paid for three cycles ($18,000 x 3) plus six transfers ($3,000 x 6) or $72,000 in total. As we discussed in the mosaicism chapter, there is a small risk this patient has a mosaic embryo but is falsely told all her embryos were aneuploid. We believe this occurs 4 times for every 100 embryos labeled aneuploid. Thus, for a woman with four “aneuploid” embryos, there is a 1 - 2% chance they will lead to a live birth. If she foregoes PGS and just transfers those embryos, these are her chances. If she undergoes PGS, accepts the aneuploid diagnosis, and elects to discard them, her chances of success with them are now zero.